She may be known as America’s sweetheart, but Reese Witherspoon’s latest acquisition has animal activists up in arms. The Oscar-winning actress has been spotted around Los Angeles toting a $4,000 Chloe Paraty bag made of genuine python leather. Considering that sales of the exotic skin have been banned in California since 1970—not least because of the unfathomable cruelty involved—it’s a pretty good bet that Witherspoon won’t be fielding nominations for PETA’s “sexiest vegetarian” anytime soon. In fact, the animal-rights group fired off a strongly worded open letter on Tuesday morning, condemning Witherspoon for her complicity in the animals’ “hidden suffering” for fashion’s sake. Under California Penal Code Section 653o, it’s illegal to import the “dead body, or any part or product thereof” of pythons to sell or with the intent to sell within the state. Luckily for Ms. Witherspoon, however, it’s perfectly legit to purchase python-skin products across state lines before heading back to California. Every year, millions of snakes are impaled on hooks or nailed to trees by their heads and skinned alive, says PETA. Because of the abject cruelty, PETA has persuaded popular retailers such as Adidas, Nike, H&M, Cole Haan, and Victoria’s Secret to abstain from the sales of exotic skins. Still, there’s a chance that Witherspoon’s cavalier attitude towards animal welfare is a result of ignorance rather than malice. PETA has promised to send her an undercover video exposé of the exotic-skins industry, hosted by none other than her Walk the Line co-star Joaquin Phoenix. 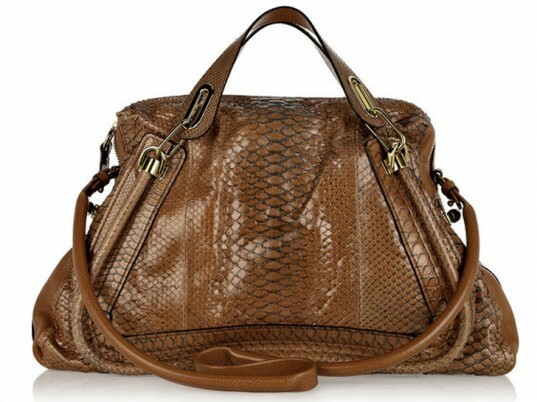 Gossip Cop reports that Witherspoon is giving up her python bag. As a token of its appreciation, PETA will be sending her flowers. “We’ve long known Reese to be a kind person, so we’re pleased—and not surprised—that she is hanging up her python bag for good,” the group says in a statement. It's a beautiful bag. Why assume this bag was made in a way that was torturous to the snake? It is quite possible it was made in a completely humane way. I am totally against any sort of animal cruelty AND human victimisation also! CJ! I am so with you and happy to see people out there still thinking and speaking like this! I don't believe that "humane" exotic skins exist just as I don't buy into the notion of "humane" meat. I wouldn't know if this bag was attained in the manner described as I don't know enough about the trade to say, however, I don't believe that fur or skin could ever be obtained "humanely". Of course it is a beautiful bag, as is fur, as animals are beautiful. I think that the use of animals for food or fashion, especially fashion, is cruel and unnecessary. pythons are ruining the Everglades, eating endangered species and becoming a local menace. Now what? Killing them humanely to protect the ecosystems and using skins for bags and meat for zoo feed or something makes more sense than letting them rot. Humans have created a lot of problems and different situations will necessitate different solutions. OMG! Keep putting that gorgeous handbag in my face and I won't be able to resist it much longer! You, PETA, harp on the "cruelty" of how they are skinned & left to die a slow lingering death... yet this is an animal that by nature slowly constricts its prey while slowly devouring it...emphasis on SLOW DEATH! Now, had you approached it as a PROBLEM WITH THROWING OFF THE NATURAL BALANCE OF AN ENVIRONMENT...I'D HAVE BEEN RIGHT THERE BACKING YOU! She may be known as America's sweetheart, but Reese Witherspoon's latest acquisition has animal activists up in arms. The Oscar-winning actress has been spotted around Los Angeles toting a $4,000 Chloe Paraty bag made of genuine python leather. Considering that sales of the exotic skin have been banned in California since 1970�not least because of the unfathomable cruelty involved�it's a pretty good bet that Witherspoon won't be fielding nominations for PETA's "sexiest vegetarian" anytime soon. In fact, the animal-rights group fired off a strongly worded open letter on Tuesday morning, condemning Witherspoon for her complicity in the animals' "hidden suffering" for fashion's sake.